Anyone familiar with Gainesville already knows about the city’s most notable historic structures, including the Thomas Center, the Hippodrome Theatre (formerly the U.S. Post Office) and the many iconic red-brick buildings on the UF campus — all at least 100 years old. 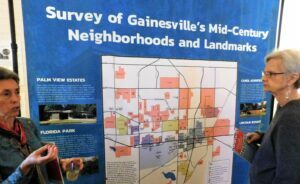 However, Gainesville also has numerous “modern” structures — homes, churches and educational buildings — that were constructed in the decades after World War II that are worthy of historic status because of their distinctive architecture. The Matheson History Museum hosted an opening reception for the exhibit on Thursday night. 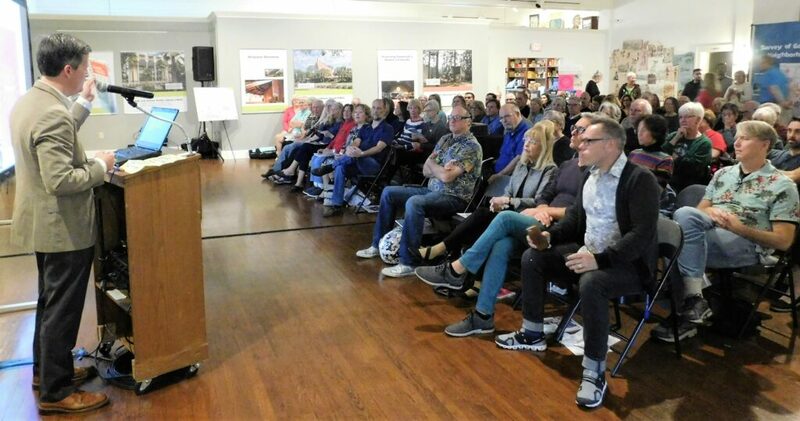 A standing-room-only crowd heard Hylton talk about the importance of preserving Gainesville’s Mid-Century Modern architectural gems. He lamented the recent demolition of St. Michael’s Episcopal Church in northwest Gainesville for which he had written the landmark nomination. “It was against the owners’ wishes and they made end-runs around our [city] ordinances,” Hylton said. Gainesville Modern is a non-profit organization that advocates for the preservation of Gainesville’s Mid-Century Modern architecture and promotes the city’s future architecture through education, advocacy and awareness. Marty Hylton, president of Gainesville Modern, welcomes guests to the opening reception for the “Gainesville’s Modern Landmarks” exhibit at the Matheson History Museum on Thursday night. (Photograph by Gainesville Downtown). On Saturday, the Mid-Century Modern Home Tour takes place from 11 a.m.-4 p.m. at seven residences throughout northwest Gainesville. The homes were built during the 1950s and ’60s and are examples of the Mid-Century Modern architecture. Tickets are $20 ($10 for students) and available through gainesvillemodern.org. Hylton said Gainesville Modern Weekend is patterned after Modernism Week in Palm Springs, California. The desert community is a literal hotbed for the Mid-Century Modern movement. This year’s event, held in February, included a tour of Frank Sinatra’s 1947 Twin Palms Estate designed by E. Stewart Williams. Earlier this week, Ron and Barbara Marshall drove the 2,300 miles from Palm Springs to Gainesville to speak at Thursday night’s opening reception at the Matheson Museum. They talked about their book titled “Concrete Screen Block: The Power of Pattern.” The 120-page book, published in 2018, tells the history of a popular element of Mid-Century Modern architecture. 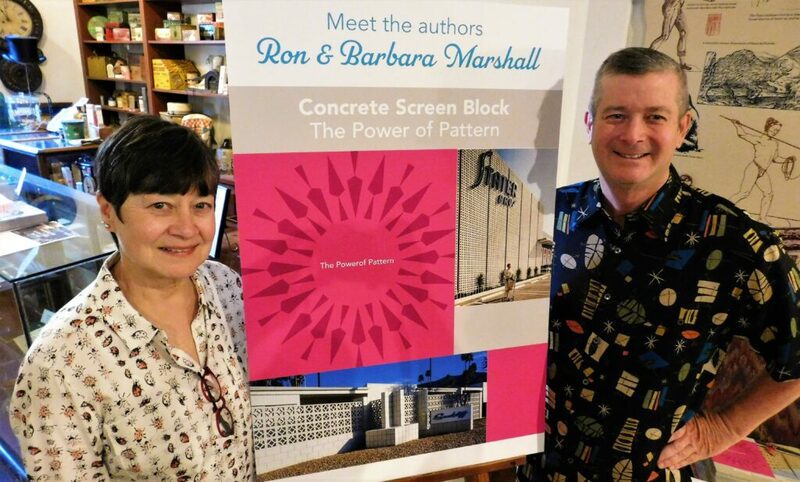 The Marshalls, both retired government workers, admitted that concrete screen block is not necessarily the sexiest topic for a book, but they became interested in the material when they began wintering in Palm Springs from their native Baltimore and became active in historic preservation. Ron Marshall said that California and Florida probably saw the greatest concentration of concrete screen block during the Mid-Century period. Gainesville was part of that trend. Barbara Marshall added that the blocks are like little pieces of art and that many of the blocks can be put together to achieve different patterns. Hylton offered a bit of news to those attending Thursday night’s reception at the Matheson Museum. He announced that, for the first time, Gainesville’s University Lutheran Church is moving forward with a landmark designation. It would become the first historic preservation landmark in Gainesville built after 1945. The distinctive church, located at 1826 W. University Ave. (across from UF’s Ben Hill Griffin Stadium), was constructed in 1961 and designed by architect A. Wynn Howell. The initial phase of the survey sponsored by Gainesville Modern helped identify some 20 buildings that showcase the Mid-Century Modern period and should be considered for future protection. “This exhibition presents for the first time publicly the neighborhoods and buildings that should be landmarks,” Hylton said. 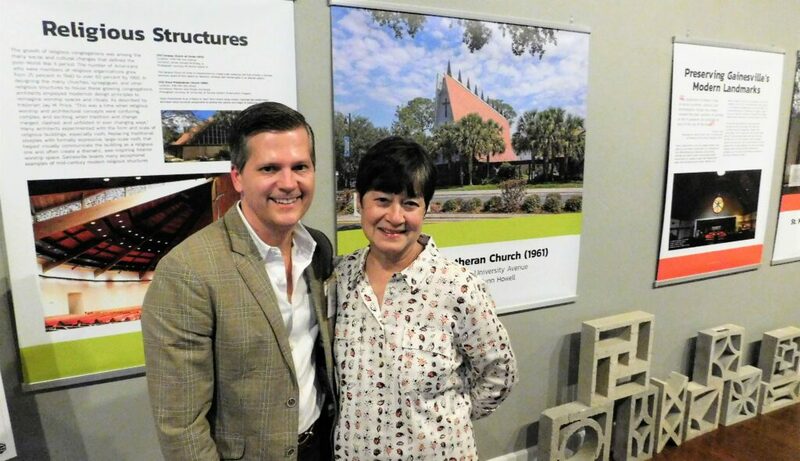 “Gainesville’s Modern Landmarks: Celebrating Our Mid-Century Architectural Past [1945-1975]” is open for viewing at the Matheson History Museum, 513 E. University Ave., now through January 2020. Museum hours are 11 a.m.-4 p.m. Tuesdays through Saturdays (closed Sunday and Monday). Admission is free. 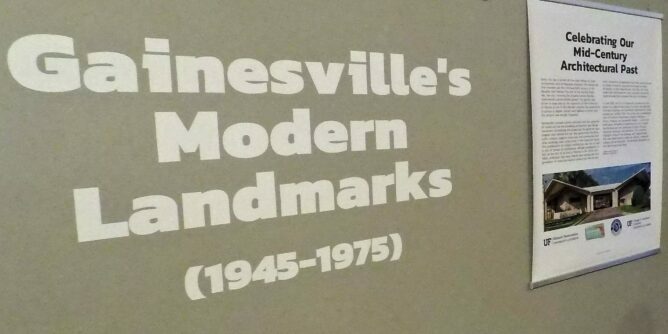 For further info about Gainesville Modern Weekend, visit the Gainesville Modern website.